When it comes to baby growth, It's all well and good to hear your baby is in the 90th percentile for height, for example. So you understand that only 10% of babies are longer than yours at his or her age. But in practical terms, this means your baby is so tall, he or she is as tall as a much older baby. For example, a baby in the 95th percentile at 4 months of age, is the height of an average 1 year old! 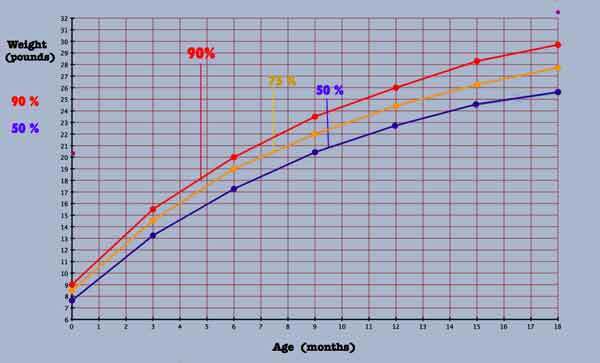 Take a closer look at the height percentiles in the baby growth charts, and slide over to see where your tall baby's height falls for OTHER ages. Cross-referencing the baby percentiles puts in in perspective. Knowing these details, may help you buy clothes, (we were buying 9-12 month sizes after 4 months). You may also be better able to decide if a particular activity toy will actually fit your child too. Any toy your gear your baby has to sit in or on, must "fit". 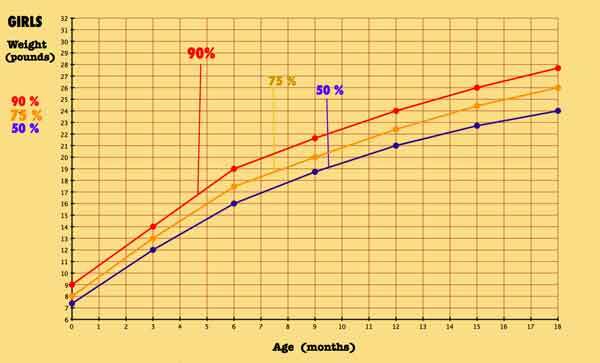 Since many visitors have been wondering if they're baby is "big" as well as tall, we've recently added this weight percentiles chart below. Use your browser's zoom button, (probably under the "Window" menu at the top), to see the specifics up close. recommended here. If your baby at 5 months is the height of an average 1 year old, and the average weight for that same age, you can merely buy clothes of that bigger age. If your baby at 5 months old, is the length of an average baby at 1 year, PLUS is bigger than the average (50%) for that 1 year age, you may need special, bigger clothes, such as those also described previously.